A difficult Six Nations may be about to get even tougher unless Ireland can muster up a massive shock at home to France. Defeat to Italy last time out punctured the momentum that Ireland had wrestled back after beating Scotland following the heavy defeat to England. They go into this evening's game without two key players due to injuries to Leah Lyons and Michelle Claffey. But on the bright side, it does allow Ireland to further strengthen their talent pool. That is what this campaign has been mostly about, and Adam Griggs has already used close to 30 players. There is a realisation that Ireland cannot rely on the same core of 20 or so players and from that end it has been pleasing to see so many new faces, and Enya Breen becomes the latest to make her Ireland debut at Energia Park tonight. The flip side of that means that there will be some sticky results along the way but even so, losing to a professional England side is one thing, being beaten by Italy is another. "I don't know if we are on the back foot," Griggs maintained. "We are a young group and I think what we are seeing at the moment is that we are starting to do some things really well but then there is just that inconsistency with backing it up with some of the smaller details. "If you said to us that we would have scored eight tries in the last two games, we'd probably be happy with that but the fact of the matter is, you have got to defend with that as well. "It might not be the same year, two years or five years probably before you start to see the fruits of the labour that we are putting in at the moment. "When those players are up around 20-30 caps and then our other caps are up around 60-70, that would be our succession plan in place really." Munster centre Breen will form a new-look midfield partnership with Sene Naoupu, while inside of them Kathryn Dane keeps her place at scrum-half with a welcome recall on the bench for Nicole Cronin. 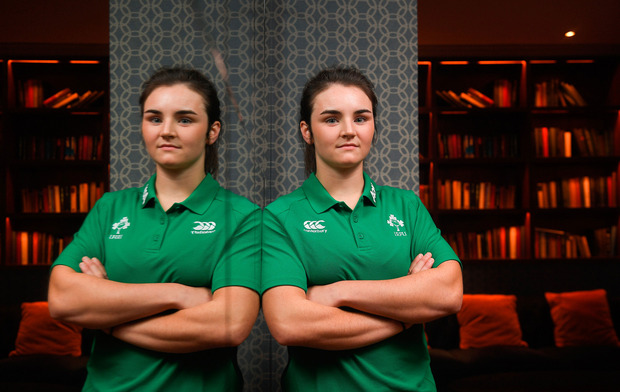 Lindsay Peat has to make do with a place amongst the replacements as Laura Feely is given the nod at loosehead alongside Deirbhile Nic A Bhaird (below), who makes her first Six Nations start, and the experienced Fiona Reidy. Speaking of experience, the back-row is full of it as captain Ciara Griffin switches to blindside with Claire McLaughlin coming in at No 8. Claire Molloy completes the formidable unit that will need a big performance. That France are able to recall the current World Player of the Year Jessy Tremouliere shows their enviable strength in depth. The title may be beyond the visitors as England look set to win the Grand Slam, but France will want to finish the Six Nations on a high. "I watched the game against Scotland where they probably left a few tries out there as well," Griggs warned. "There is no doubt about it, they are a strong side. They are going to be physical. Their pack is big but can also move around. Then their halves can control the game brilliantly. "Our biggest message this week is that you've got to expect the unexpected like any typical French team because they are pretty good at playing what they see, off the cuff. "We definitely think there are a couple of spots where we can exploit them so we have to make sure we focus on that and try and get that right. I think if we can start well and get ourselves into the game, you just never know." Ireland will need a good start and more but even at that, it may not be enough against a strong French team. Ireland Women - L Delany; E Considine, E Breen, S Naoupu, A Miller; N Fowley, K Dane; L Feely, D Nic A Bhaird, F Reidy; A McDermott, N Fryday; C Griffin, C Molloy, C McLaughlin. Reps: E Hooban, L Peat, L Djougang, A Caplice, C Boles, N Cronin, E Murphy, B Parsons. France Women - J Tremouliere; C Boujard, Y Yengo, G Vernier, L Jason; P Bourdon, Y Rivoalen; L Arricastre, C Thomas, C Joyeux; A Forlani, C Ferer; G Hermet (capy), C T Diallo, R Ménager. Reps: L Touye, M Traore, C Pelle, L Bobo, F Lecat, E Coudert, C Imart, M Ménager.